My son is on school vacation.....again. Boy they get a lot of time off, don't they? Wish I had that much time off from work. Anyway, this will be another week of me cooking things for him to munch on while I'm at work. So I started with this one - it's an old recipe that I pulled out of the archives. I haven't made this in ages. It's another one of those recipes from a church cookbook. I've changed a couple of things, just to give it even more yummy cinnamon flavor. Everyone loves this bread. So good warm with butter. It doesn't last very long in my house. Enjoy! Preheat oven to 350 and spray a loaf pan (9" x 5 1/2") with cooking spray. In a large bowl, cream together the egg, vanilla, butter and 1 cup of sugar until smooth. Add the buttermilk, flour, and baking soda and stir until just combined. Add the cinnamon chips and stir to incorporate. In a separate small bowl, mix together the 1/3 cup of sugar and cinnamon and set aside. Pour 1/2 of the batter into the loaf pan. Sprinkle 3/4 of the cinnamon mixture on top of the batter then add the remaining batter. Sprinkle the last of cinnamon mixture over top of the batter, then swirl with a knife. Bake for 45-50 min. or until toothpick comes out clean. Cool in pan for 20 minutes before removing to cool completely on a wire rack. Hi Joy , This sounds great! I'm pinning it ! I saw the photo on Tasteologie and the recipe looks great. Yes, we've got the kiddos home this week as well for school vacation. I can't wait to try this recipe. Thanks! Can you substitute anything for the cinnamon chips? I can't find them anywhere here in Australia! Hmmmm, I've given this some thought & I don't know what else you could use. Maybe just add extra cinnamon - of course it won't yield the same result, but probably similar. I often find these chips around Christmas and stock up my freezer. Personally I don't think these should only be sold around the holidays as they are a staple in my house. How about toffee chips? They may not be cinnamon-y, but I bet it'd still be terrific. Hi - this Recipe looks so good! I was wondering about the cinnamon chips - I don't know where to find them - what store are they sold? I just got Cinnamon Chips online at www.preparedpantry.com. They use real cinnamon and natural ingredients - no trans-fats. They are tiny - smaller than mini chocolate chips. The folks at Prepared Pantry were very pleasant. - I ordered on Tues and needed chips for a baking project on Sun. They got my order to me by Thurs! I didn't have to pay a shipping surcharge either. The chips are on sale this week in a 30 oz bag for 7.99 - that's about $5 off - I got 2 bags - 1 for the freezer. The bags come in vacuum sealed foil and are re-closable. I couldn't locate chips either; so, I crushed hard cinnamon candies in food processor... my family/friends loved it!!!!! You might be able to find these cinammon chips at King Arthur Flour. KAF.com. They have all different types of banking goods including flavorings, chips, extracts, oils etc. Hope this helps. You can make your own cinnamon chips. Do a search online for homemade cinnamon chips. Easy and really good. Going to make this bread this afternoon. Hey, several months ago when I found this recipe online. I found cinnamon chips at Walmart!! And the brand? Hershey's!!! What's wrong with adding chocolate chips? You can't go wrong with chocolate. What are cinnamon chips and where do i find them? They look like chocolate chips but are cinnamon. They are in the chocolate chip section at my grocery store. I purchase cinnamon chips from KingArthurFlour.com! I know that they are sometimes available in the local grocery store near the chocolate chips, however, not the same.....I HIGHLY recommend King Arthur Flour products! (a bit on the pricey side, but quality products). I agree - I try to buy local as much as possible. King Arthur is a Vermont based company, so I mostly buy from them. The Prepared Pantry also sells them and other baking supplies. I tried it with chocolate chips because I didn't have the cinnamon chips and it is awesome!!!!! Love Amish recipes. I've made the friendship bread. I make lots of bread at Christmas time. Banana nut, Cranberry & Blueberry Bread. Will be adding this to the list. There are several recipes online for making cinnamon chips from scratch----google. If you go to www.hersheysstore.com and click on the Hershey's Brand, you will find their whole line of baking chips...including cinnamon. what is the yellow or orange in the picture of the bread? 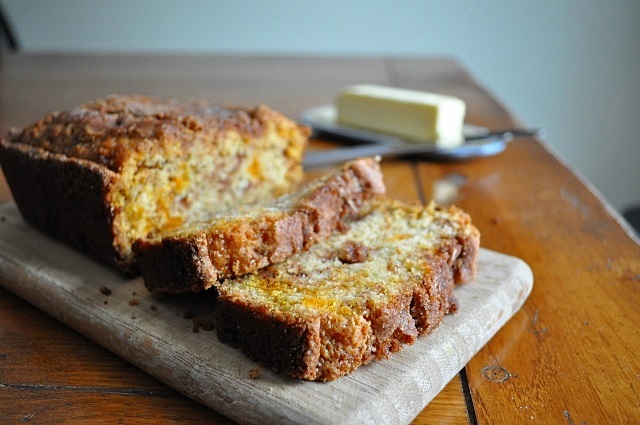 Orange is the color of the bread and yellow is the butter spread on top. I would venture a guess that the orange may be the melted cinnamon chips? I was wondering the same thing. It looks like orange marmalade. I don't think it is butter. I doubled the recipe, baked it in a 13x9 pan. Didn't have cinnamon chips so added a 1/2 tsp more cinnamon!! Delicious!! Definitely will make again!!! I can't wait to try this bread, looks so good. love all the recipe's..
this bread looks awesome.I do have a question, do you make sourdough bread and if you do. Is a recipe on your site. I am forever trying to get that sour dough taste, but yet to get it. I use the instant potato recipe. Thanks and keep up the good work. any place in western Canada to get the Cinnamon chips? I am not familiar with Canada, so I would suggest asking around or ordering some online. Good luck! I think that would turn it into a whole different kind of bread, but I bet it would yummy! my friend made this bread and loved it! I will be making this tomorrow. thanks so much Joy I will be following your blog. Why use vinegar instead of butermild?my Amish aunts have always used buttermilk. It's basically the same thing, so feel free to use the buttermilk. I have made this several times and it has been a hit every time I have served it or brought it somewhere. The cinnamon chips are easy to find here in Chicago as Hershey's makes them and they tend to have them in Walmart or Target but I did add some chocolate chips once since I forgot the cinnamon chips and it was excellent too! Thank you very much for commenting & I am so glad it's been a hit! This sounds and looks so good! Could not find the cinnamon chips so I will use the chocolate chips instead. Will hunt again for the cinnamon chips as I want to make this tomorrow and don't have time to search. I find the cinnamon chips at my local grocery store in the same area as the chocolate chips. 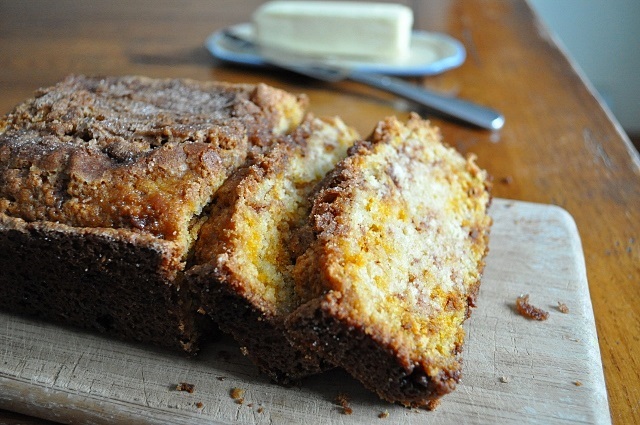 I made this Amish cinnamon bread for a breakfast meeting and it was a huge hit. I buy my cinnamon chips from The Prepared Pantry (referenced above). Have bought from them for years. There is no comparison of the kind purchased in the grocery store to the ones from Prepared Pantry - they are a completely different texture and melt perfectly, unlike the store bought kind which I have occasionally used and really are not very good. But this bread is awesome and is now incorporated into my morning breakfast baked goods. Thank you for sharing! I had no problem finding the cinnamon chips (they were mini ones). Eileen's is the brand I used. This bread is good hot! Best bread you can make for someone. It was so simple. I used powdered buttermilk in the can *I don't use buttermilk often enough to buy it*. 4 T to 1 cup of water. Mixed well. Worked perfectly. Thanks for the great recipe! I used icing on top of this recipe. 3 T butter, 3 T heavy whipping cream, 3 oz. cream cheese and powdered sugar to the consistency I needed. Drizzled it on while it was still warm. Wow! Really good! Looks very tasty. Have not found cinnamon chips in stores here (Ireland). Son has just gone to USA for a 3 week holiday. Shall e-mail him and ask him to bring me home some then I shall make this bread. Thank you for the recipie. What is the yellow coloring inside the loaf of bread? That color is from the cinnamon chips. I thought the recipe said it went into two pans. Since I live alone and love these morning miracles I make Individual cupcakes and freeze them. When I want them all I do is heat in microwave for 30-40 seconds. YUM! The recipe says only one pan. According to one of the comments maybe I should use two loaf pans. Right? This recipe is for one loaf pan. I do not know why someone had a problem...perhaps they measured the ingredients incorrectly. Good luck & thanks for visiting! I can just imagine how amazing this smells when it’s baking!! Beautifully done!